Looking for batting to use in your next quilt? Consider “Arctic Bamboo Batting” that we offer both by the metre or in a full roll. It comes in either 96 or 124″ widths and comes from a warehouse in Vancouver, BC. Arctic Bamboo Batting is a natural fibre, of course which makes it breathable; warm in the winter and cool in the summer. It is easy to machine quilt through. This batting is 50% natural bamboo and 50% cotton–best of both worlds! It drapes well and is soft and supple. It has a right and wrong side to it and the wrong side should face down when you create your quilt sandwich. When you make your quilt you can stitch up to 8″ apart without fear of bunching or twisting. 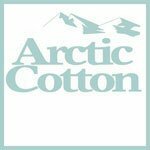 We hope you will try Arctic Bamboo Batting the next time you are selecting quilt batting for your project. Happy stitching! How do you know which side is the right side? What effect does using it the wrong way, have on the quilt? Debbie, that’s a good question. Upon examination of your batting, you might want to see if one side over the reverse side appears smoother or has a different appearance. I don’t really concern myself too much with which side of the batting I have facing up, however, it’s completely up to you. I’ve never noticed a difference in batting effectiveness. Uncle Allan, the queen size bamboo batting of the bolt is $16.98 per metre and the king size is $19.98 per metre as per the website. If you want a full bolt, we can help you with that too! Thank you for your info. Does all Bamboo batting have a right and wrong side. I have some that I haven’t used yet. Marlene, that’s a good question. Upon examination of your batting, you might want to see if one side over the reverse side appears smoother or has a different appearance. I don’t really concern myself too much with which side of the batting I have facing up, however, it’s completely up to you. All batting that is needle punched has a “right” and a “wrong” side. You want your quilting needle go through the batting the way the needle went through during the needle punch process. I find it easier to feel than to see. The wrong side has little “pimples”, the right side feels smoother. “Dimples up, pimples down” is a good way to remember. If your batting is facing up with the wrong side, you might experience more bearding, and it can also create tension issues.